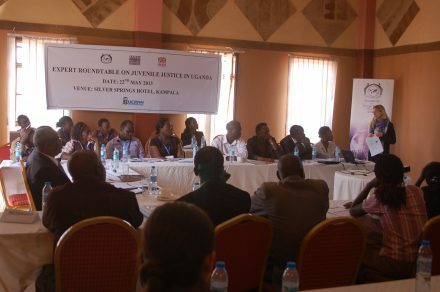 Over 35 experts on juvenile justice convened in Kampala on 22 May 2013 and pledged more collective and concrete action on juvenile justice reform in Uganda. The roundtable, organised by The Foundation for Human Rights Initiative (FHRI) in partnership with Penal Reform International (PRI) and the Uganda Child Rights NGO Network (UCRNN), was attended by the Hon. Justice Lameck N. Mukasa, Head of the High Court Criminal Division, as well as representatives from child rights and justice civil society organisations, lawyers, and senior officers from the Uganda Human Rights Commission, Police and Prison services. ‘The discussion brought relevant stakeholders together…. [enabling] deeper and practical discussion on Juvenile Justice issues that will be useful in forging the way forward’, Participant feedback. Participants agreed to work together on practical ways forward on recommendations made in the report, including promoting alternatives to detention, independent monitoring of detention centres and trials, evidence gathering, and advocacy on enforcement of existing legislation. Participants also agreed to share and scale up best practices, for example on child friendly courts and community volunteers to support children in contact or conflict with the law. Download the Concept Note and Agenda. A report of the roundtable will be available soon. This event was supported by PRI’s grant from the UK Government.